It’s that time of year again! Everyone in Traverse City is looking to dine al fresco -- on a patio, deck or overlooking Grand Traverse Bay. There’s a lot of great places where you can eat outside, we’re highlighting a few of our favorites. 7 Monks Taproom is a beer and food lover’s paradise. Their Traverse City locations have over 45 beers and ciders on top at any given time. Most of them are Michigan made, too. They are perfectly curated for the seasons and they change often. This has been one of my favorite places to grab a drink for a long time, but it wasn’t until recently that we tried the food there. I immediately wondered what I had been doing all these years! Their menu isn’t huge, but you can expect amazing quality. 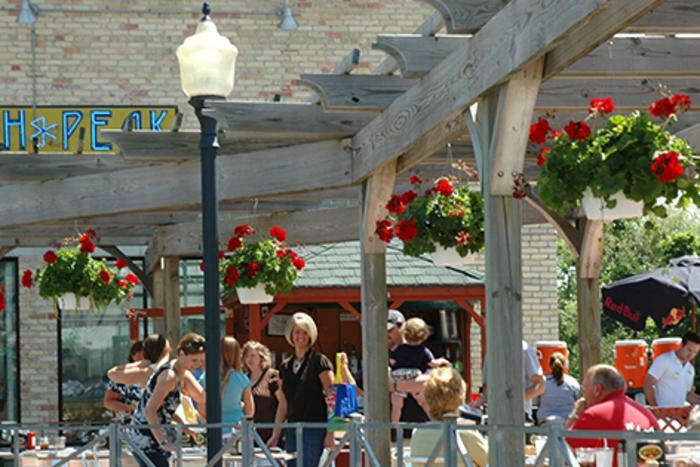 Sit on their sidewalk patio, and enjoy the warm Northern Michigan summertime. Order a gourmet burger or their insane Mac and cheese! If you want something a little lighter you can opt for the veggie sides like their crispy brussel sprouts, or Ahi Tuna ceviche. You’ll definitely want to wash it all down with a cold brew. Let the staff help you figure out what you’d like. They’re knowledgeable and friendly. If you’ve been following our work, you probably noticed that this wasn’t the first time (nor will it be the last) that we’ve mentioned how great the food at Harvest is. You can catch them at their food truck, the Roaming Harvest at The Little Fleet, or go check out their flagship location where they have plenty of indoor and outdoor seating. Harvest’s menu changes often, so you can always expect a fresh take on some of your favorite food. They call it “local, sustainable, comfort food.” We’d have to agree. They have very close relationships with local farms to produce delicious seasonal cuisine. You’ll also notice that their menu is globally inspired, and a lot of it mimics street food favorites from around the world. One of our recent favorites is the falafel wrap. Harvest has a variety of drinks like kombucha, Thai iced tea, and local Northwoods soda, as well as tons of beer and wine options. North Peak Brewing Company is home to award-winning brews that are made on-site. They have been a staple in Traverse City since 1995, serving up great food in a fun atmosphere. The space is huge, inside and outside. Their large outdoor deck is where you can expect to find live music almost every weekend in the summer. North Peak has an extensive menu and we would recommend their salads, sandwiches, burgers, pizza and beer of course! One of our favorite appetizers are the cheese sticks, wrapped in wonton paper. If you’re indecisive like us you can even get a beer sampler, which is five different beers. Our favorites were the Northern Light and the Siren Amber. We enjoyed the porters as well. Like many of the spots on this list, Amical has become a staple around town. Established in 1994, Amical is located right in the heart of Downtown Traverse City and offers vibrant European style cuisine. This bistro is also known for sourcing locally and seasonally, to bring you the best flavors of the region. Sit in their dining room where you can watch chefs at work in the open kitchen or enjoy your meal on their street-style patio. Some of our favorite picks on the menu were the morel mushroom tarte, tomato soup with a puff pastry top, and raspberry creme brulee for dessert. Apache Trout has one of the absolute best views to check out when in Traverse City. Another longtime favorite, it’s been in business for over 20 years located right on the Grand Traverse Bay. They have a fantastic bayside patio, and a dining room with huge windows overlooking the water, in case you don’t want to wait for a table outside. They are known for their fresh seafood, ribs and steaks. We split a bottle of wine and ordered a variety of appetizers. Our favorites were the BBQ shrimp wrapped in bacon and the lightly fried calamari. In case you’re hungry for more great dining options, follow along on our page as we post photos of some of our favorite bites in Traverse City often! Briana DeBolt and Chamere Orr are a couple and dynamic duo that live in Chicago and tell their foodie stories through Chamere's beautiful photos. Briana is originally from Traverse City, and the pair makes frequent trips up to get away from the hustle and bustle of the city and enjoy all Traverse City has to offer. Together, these two make up A Full Living. They explore adventures in food all over the world, looking for the best dishes. They also create simple recipes at home. Want to follow more of their foodie adventures or try out some new recipes? Follow them on Instagram for daily updates.